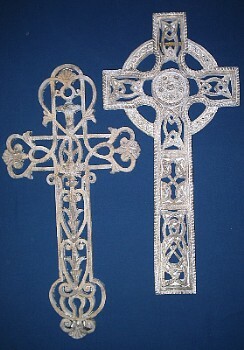 Set of 2 large Gothic Celtic Crosses perfect for your Inspirational,Gothic or Medieval display. 10"L x 3/4"W x 20 3/4"H Cold cast resin. Sturdy Hangers. Absolutely gorgeous! These are not small crosses, they are large in size. Price is for two crosses. A real deal~! We have sold out of this product and it has been discontinued.